UNDERWRITING: Who's making a profit? Eighteen months ago insurers claimed they were going back to basics. It was time to start charging the right rate for each risk. Years of under-pricing needed to be corrected, claims costs had to be reduced and expenses kept to a minimum. Plummeting stock markets meant investment income could no longer be relied on to shore up poor results. Underwriting for profit became the mantra. The change in attitude was swift and decisive. Underwriting criteria were, apparently, tightened, unprofitable lines of business were withdrawn, and terms and conditions were restricted. Initiatives such as Allianz Cornhill's Underwriting Academy were started to raise the technical standards of the underwriting staff and provide them with the necessary skills to produce profitable books of business. New systems were put in place to assist underwriters in their decision-making, such as more advanced modelling tools. And greater focus was placed on ways to reduce claims costs such as rehabilitation. But, 18 months on, have insurers been successful? Have they achieved the return to profitable underwriting they have been talking about? The answer can be found by looking at insurers' combined ratios in their 2002 financial results. How this ratio has changed from 2001 to 2002 is also revealing. The combined ratio is a standard insurance accounting ratio. It is the ratio of claims, expenses and commissions to premium income. A ratio of over 100% shows the insurer is making an underwriting loss; a ratio under 100% shows a profit. The figures (see the table) show mixed fortunes for insurers. In commercial lines, insurers have generally seen improvements in their combined ratios. Aviva improved by 6% and CIS by 5.9%. Royal & SunAlliance (R&SA) achieved a 26.8% improvement in its commercial combined ratio from 125% in 2001 to 98.2% in 2002, and QBE's European operations improved by 20.2% to 98.9% in 2002. The exception was Churchill, which saw its combined ratio rise from 100.6% in 2001 to 102.6% in 2002. The strength of the commercial market has been a major factor in these improvements, with rates rising by more than 100% in some lines of business. Nevertheless insurers are still failing to make underwriting profits. With the exception of R&SA and QBE, the commercial lines combined ratios are still above 100%. But Standard and Poor's credit analyst Rob Jones says they should be viewed positively. "The figures show that the underlying trends are in the right direction. They reflect the fact that the market is approaching the end of the cycle and that prices have been improving." 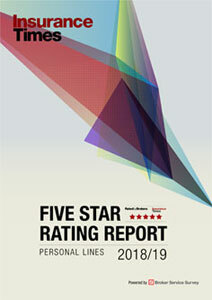 But while commercial lines market is producing a positive performance, personal lines are doing less well. Some of the best-known names in the market have shown deteriorating results, and others have failed to make any significant improvement. Lloyds TSB's combined ratio slipped by 10%, R&SA's by 7.6%, Aviva's by 3% and Direct Line's by 1.4%. But Churchill and CIS's combined ratios each improved by less than 0.5%. The poor performances of R&SA and Aviva are significant. R&SA's deterioration is quite a considerable jump further into underwriting loss, and Aviva's slip pushed a previously profitable line of business into the red. R&SA director of UK personal lines Blyth Morris says the company's poor performance was due to increased claims costs. "In the household sector the deterioration was due to increased weather claims in 2002 - flooding and storms. In the motor sector, the cost of injury claims increased substantially. There has also been an increase in underlying claims costs. People have more expensive personal possessions than they used to, so the average cost of a claim is substantially higher." But Morris denies that the results demonstrate an underwriting failure. "We accept we have to look at more sophisticated techniques and take a more dynamic approach to the segments we write. We also need to take specific action to reduce costs such as increasing excesses and looking at where the business comes from. We are also looking to put rates up - in excess of 10% on household - and they will probably increase further. "The increase in combined ratio from 2001 shows just how much claims are going up and demonstrates that we need to react." Nevertheless the results suggest that R&SA has failed to accurately price risks, which is at the heart of good underwriting. And R&SA is not alone. Aviva has also suffered from a failure to accurately price risk. Norwich Union head of underwriting Laurence Loughnane blames competition. "We were not able to get through the rating increases that we would like. It is a direct result of competition and is a question of timing. We are focused on getting the right price and the right risk. We would not expect any further deterioration to take place." But despite competition and increased claims costs some insurers have managed to improve personal line business. Motor insurer Cox saw its combined ratio improve by 3% to 89% in 2002. And Admiral, another personal lines motor insurer, reduced its combined ratio from 91.2% in 2001 to 80%. Admiral chief executive Henry Engelhardt says that the key to its combined ratio was a claims ratio of 64.6%, due partly to lower than expected bodily injury claims. Other factors were good risk selection pricing and claims management, he says. Cox chief executive Neil Utley says: "We pride ourselves in fully reserving for claims. It is our job to factor all potential costs, such as changes to the discount rate and increasing injury awards. "Other insurers have failed to reserve properly for these things." But the combined ratio may not always tell the whole story. A case in point is AXA. The company's published combined ratio for general insurance activities showed an unremarkable improvement of 0.1% to 115.2% - still a significant loss. But the performance is better than it would first appear. AXA finance director Patrick Regan says that underlying combined ratio actually improved by 6% to 107% in 2002 owing to a reduction in the loss ratio and expense ratio. The reason that this was not reflected in the published figures, he says, was due to the negative impact of increased investment in the company's business transformation programme, First Choice, and increased reserving for old claims. "We invested approximately 2% of the combined ratio in First Choice. We also looked at claims reserves, particularly large liability claims and dealt with them more conservatively. This made an impact of 6% on the combined ratio." The commercial lines figures suggest that insurers are making positive steps towards more profitable underwriting. Of course, in the current hard market this should be relatively straightforward. The real challenge will come when the market begins to soften and rates begin to decline. There are already signs that the market will reach its peak this year. Insurers need to ensure that they achieve further improvements in 2003, ideally pushing their combined ratios below 100%. But the situation in personal lines is more worrying. "I am amazed at the others in the market who have failed to make underwriting profit," says Utley. "If the market is not making a profit now, I don't know what they will be like in years to come." Utley's point is well made. 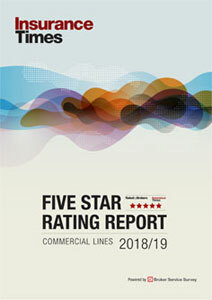 Rating increases have not been as marked as in commercial lines and there is talk of the motor market softening. For some insurers to be demonstrating deteriorating profitability at this point in the cycle is worrying. They should be making an underwriting profit now - or at the very least heading in the right direction. For both commercial and personal lines, the results for 2003 will be telling.